Spain is one of the most popular European countries with tourists for a wide variety of wonderful locations to be visited and activities to be enjoyed. Spain enjoys some of the best weather in Europe, with high temperatures and plenty of sunshine all around the country. Two of Spain's biggest countries and most popular locations to visit are Madrid and Barcelona. Madrid is the capital city of Spain, home to incredible landmarks like the Royal Palace, the Museo Nacional Del Prado, and the Plaza Mayor, while Barcelona is the biggest city and capital of the Catalonia region in the northeastern part of the country. Barcelona is well known for its artistic heritage, colorful architecture, and unique landmarks like Casa Mila, Park Guell, and the Sagrada Familia church. Both cities are also home to two of the world's most famous football clubs - Real Madrid and FC Barcelona - as well as offering dozens of top class restaurants, bars, nightlife locations, museums, and activities for visitors and residents of all ages to enjoy. Since Madrid and Barcelona are so popular, many people like to visit both of these cities on trips to the country. Madrid and Barcelona are separated by over 380 miles, with Barcelona being situated out on the coast and Madrid being located in a more central, inland part of Spain. Despite the large distance between these two major cities, it is very possible to travel between Madrid and Barcelona, with a variety of public transport options and services connecting the locations. Train travel is a very popular way to get around Europe, especially in Spain, and there are multiple train options for travel between Madrid and Barcelona. The night trains tend to be the cheapest option, but they can take a lot longer than the high speed Alta Velocidad Espanola AVE train. The AVE is the fastest form of train travel in all of Spain and has made it very quick and easy for people to get from Madrid to Barcelona, and vice versa. The journey takes just two and a half hours in total, making it much faster than traveling by car or bus. Another advantage of taking the train from Madrid to Barcelona is that the city's respective train stations are located in very central areas, offering quick and easy access to the various hotels, restaurants, and landmarks of both areas. The costs of an AVE train from Madrid to Barcelona can vary enormously, however, so you'll need to check out the schedules and shop around to get the best deals. 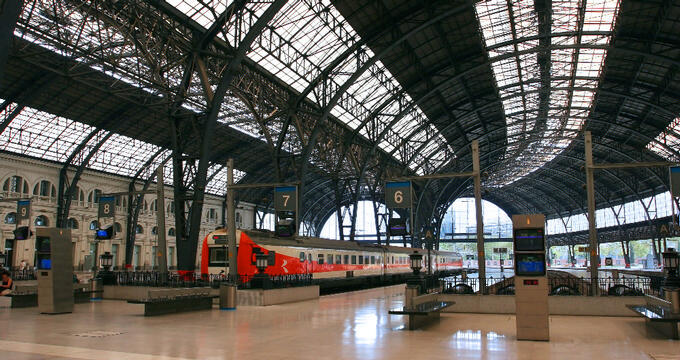 If you're looking to take a train from Madrid to Barcelona, you'll need to head to Madrid's Puerta de Atocha station. Flying from Madrid to Barcelona might seem like a complicated way to make the journey, but that was before the invention of the Madrid-Barcelona Air Shuttle. The shuttle essentially provides quick and easy transport between these two cities. It's not quite like a normal flight; you can book open tickets and you don't have to turn up hours in advance or anything like that. You can choose to travel in either economy or business class, and multiple flights run every single day, so it's always easy and convenient to fly between these cities. One of the simplest ways to get to Barcelona from Madrid is via car. Various car rental services can be found in a major city like Madrid, and the route between the two cities is relatively straightforward. Car travelers will simply need to take the AP-7 from Madrid and follow the AP-2 for most of the journey. There are several tolls along the way, so you'll need to be ready to pay, and the journey can take around six to seven hours in total. Bus travel is one of the cheapest ways to get around Spain in general and a good idea for budget-conscious travelers hoping to get from Madrid to Barcelona. Many buses leave from Madrid for Barcelona each day, with many of them leaving from the main bus station on the Avenida de America. Tickets can be purchased online at reasonable prices and you can use e-tickets on most services. The bus journey from Madrid to Barcelona takes over six hours, making it one of the slowest ways to travel between these cities.